I AM DONE! Finished! Completed! Everything important is in the ground, in the bed, in the container, in the pile -- whatever. I have been playing catch-up ever since I joined this forum. First it was the Salad Bar we had to build, then The Rescue Garden, then the BTE, then reclaiming the Salad Bar from the elements and the rollies. I must have moved 50 wheelbarrowfuls (sp?) of wood chips, horse manure, weeds, and rocks, not to mention all the plants I had to buy and put in the ground to replace what the spider mites ruined. There's always more to do, of course, but now I can relax and enjoy what I have and watch what develops, without that overwhelmed feeling -- like the princess in Rumpelstiltskin who had to spin a roomful of straw into gold. My straw is finally spun! @countrynaturals wrote: I AM DONE! Finished! Completed! Everything important is in the ground, in the bed, in the container, in the pile -- whatever. Well done CN. But I'm afraid you are not finished. I think you need to start a SFG bed. CN, You deserve a break after all the work you have done in such a short time. We had such late rains this year and you have had to squeeze normal planting in with all the new beds you have created. If I ask Hubby to build me one more bed, I'll either end up in divorce court or playing pinochle with the rollie pollies in the compost heap. @sanderson wrote: CN, You deserve a break after all the work you have done in such a short time. We had such late rains this year and you have had to squeeze normal planting in with all the new beds you have created. I love the term "normal planting." I've never experienced that before. I was up at 5:45am, touring the garden for slugs. NOT A ONE! Rollies are under control with the citrus peel treatments and everything started on the deck in Jiffy Pellets. Today I'm going to finish planting the rest of the mystery starts from the spider mite fiasco. After that, who knows? I might just sit out in the garden and read. CN, Would you please explain what the citrus peel treatment is. I have my beds covered with wood chips which seem to always attract rollipolli and pinch bugs. If the base of the plants are covered by the chips the bugs move in and start to ring the plant's base, killing them. It always seems to happen just when the tomatoes are starting to deliver. Spinosid works, but I'd like to find a cheaper solution. @Yardslave wrote: CN, Would you please explain what the citrus peel treatment is. I have my beds covered with wood chips which seem to always attract rollipolli and pinch bugs. If the base of the plants are covered by the chips the bugs move in and start to ring the plant's base, killing them. It always seems to happen just when the tomatoes are starting to deliver. Spinosid works, but I'd like to find a cheaper solution. 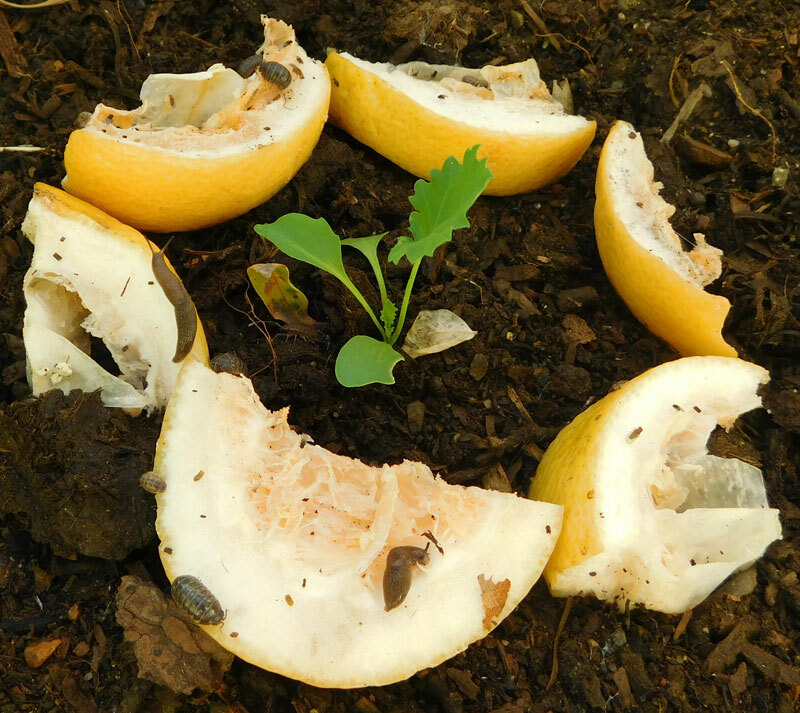 I circle the base of the plant with the citrus peels just before dark and wet them down. Make sure there are no gaps for the little creeps to get through. The slugs and rollies go to the peels. The next morning I go out early -- before the sun hits the plant -- and scoop up the peels/bugs for the compost heap. Don't let the peels dry or they'll curl up and make spaces for the bugs to get through. I don't know anything about pinch bugs, but rollies and slugs would rather have the peels than the plants. They seem to like melon rinds better than citrus, but citrus works. You might also try making a ring from the top of a plastic cup and putting around the plant stem. Anything non-organic is worth a try. I've also used expensive copper tape around the base of plants to thwart slugs. It gives off a mild jolt they don't like. You must be diligent with that, however. 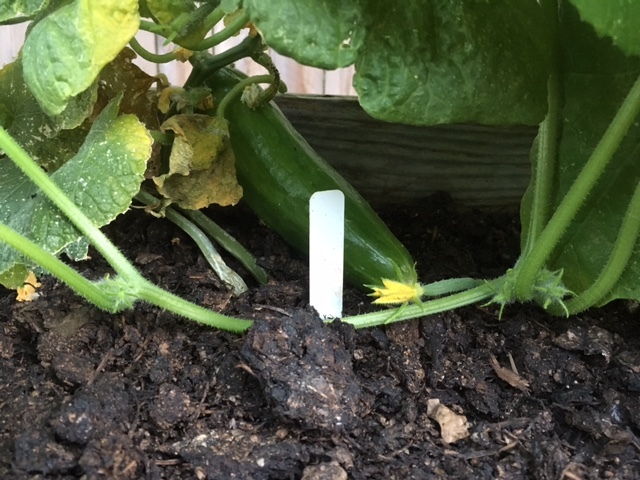 If a leaf or twig lands on the tape it can make a bridge that the slugs can use to climb over and still get to the plants. I haven't had any problems with established plants as long as I trim off any leaves that might touch the ground, so maybe it's the pinch bugs that are giving you grief and my solution may not work for you. Fingers crossed that if the peels don't work, the plastic ring will. I just planted daikons for the 4th time, after realizing the rollies ate the first 3 tries. This time I planted them in peat pots and didn't put them out until they sprouted. I put the pots in those cheap little plastic sandwich bags, then cut out the bottoms. So far so good. 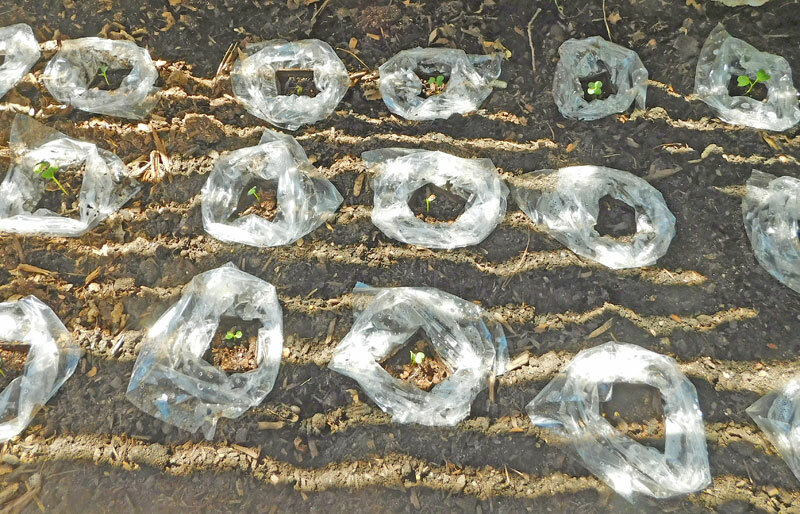 In a few days, after the radishes get their first true leaves, I'll pull off the plastic and hope for the best. If this works, it will be the cheapest, easiest (ugliest) solution of all. YS, a light sprinkle of Sluggo Plus? I know the insects like oranges on the ground, but you have to collect the insects to get rid of them. What about a few granules of SP on the citrus? Sanderson, I forgot about Sluggo, and I have some that I use on my garden ornamentals, but haven't tried it in my veggie beds. Reading the label, the ingredients look like they could also add some iron and phosphorous to the soil as it breaks down. I'll give it a try, thanks! @Yardslave wrote: Sanderson, I forgot about Sluggo, and I have some that I use on my garden ornamentals, but haven't tried it in my veggie beds. Reading the label, the ingredients look like they could also add some iron and phosphorous to the soil as it breaks down. I'll give it a try, thanks! Is that the stuff you should only use at night because it could kill the bees? @Countrynaturals wrote: In a few days, after the radishes get their first true leaves, I'll pull off the plastic and hope for the best. If this works, it will be the cheapest, easiest (ugliest) solution of all. So far the Daikons are not happy about this treatment. Several of them are dying -- looks like damping off. Maybe it's just one of those things but maybe all this plastic is suffocating their roots, so it might be just one more failed experiment. But a failed experiment shared is one less the rest of us have to try. @CapeCoddess wrote: But a failed experiment shared is one less the rest of us have to try. Thank you. That makes me feel a little better. @countrynaturals wrote: Look what I found! Last year, Katie brought home some planters that were part of a donation. One of them was small (6") and half-dead. I thought it was chives, so I put it in with my other chives plant. A few days later, Hubby found it and announced it was not chives. I took a closer look, discovered the "leaves" were not hollow, but flat. I thought it was just grass and transplanted it to the "chicken garden" -- an area down by the compost where I plant things our chickens might like but we don't care about. Someone here said it might be garlic chives -- it was. I forgot all about it after that. Yesterday, Hubby was pulling 3' weeds out of that area and discovered this 4' tall garlic chives plant. Can you believe it? The stuff I ignore does better than the stuff I nurture. Now the burning question is what do I do with them. They're basically tasteless, so for now they'll just be ornamental unless someone here can enlighten me on their uses. Could be. 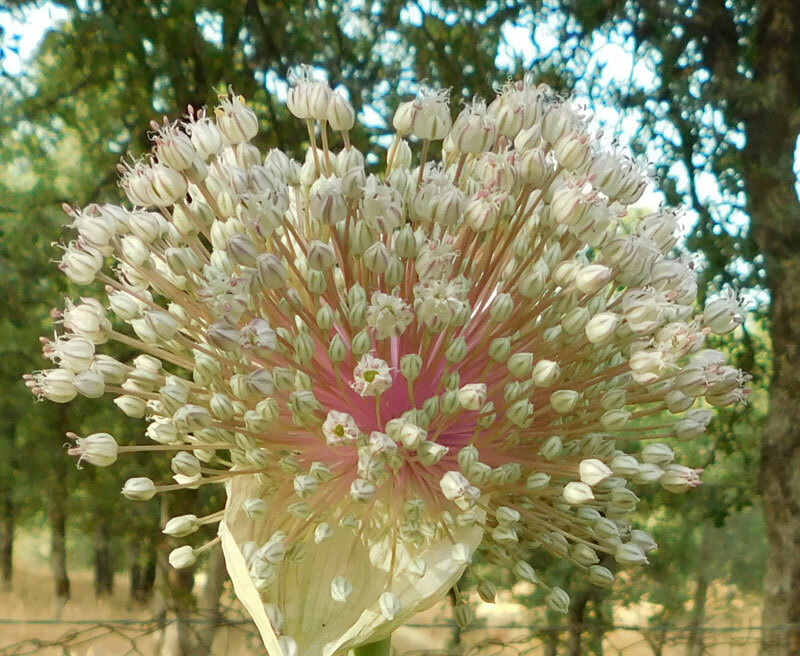 Or some ornamental from the allium family. Lucky you! It doesn't look exactly like any of them, but they are big and beautiful, so I'm a happy camper. I started this reply on Sunday night and then the photo option failed. Saved to Draft and went to bed. Very slowly I am cleaning up the back yard and patio. So far I have more hits than misses. No tomatillos, carrots, salad or radishes since I didn't plant/sow them. But, as I look around at all the little beds and other areas, I realize that with a handful of seeds, there are so many plants getting bigger. Sort of a moment of awe. For those who know my trials and woes of tomatoes, it looks like I have some this year. Planted 30, and 26 were healthy. The 4 in the 2'x4' I'm babysitting were sickly, a nutrient problem more than likely. 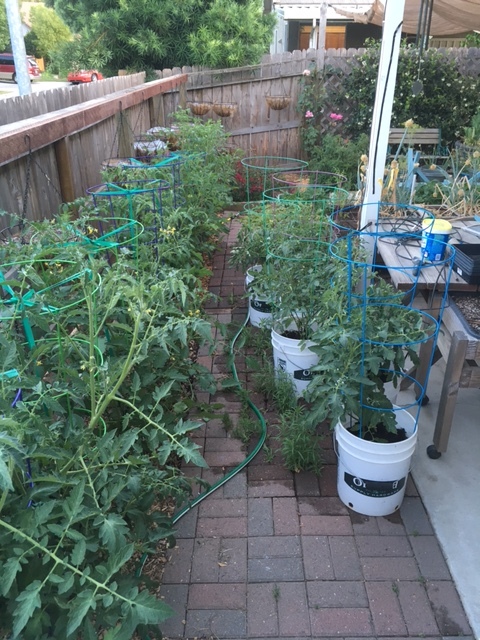 Here are 9 in the amended dirt strip and 5 of the bucketed tomatoes. They get late day shade in this area so I'm thinking that I will grow them here next year, freeing up the 2'x7' for maybe bush Blue Lakes for canning and freezing. No curly leaf viruses this year. 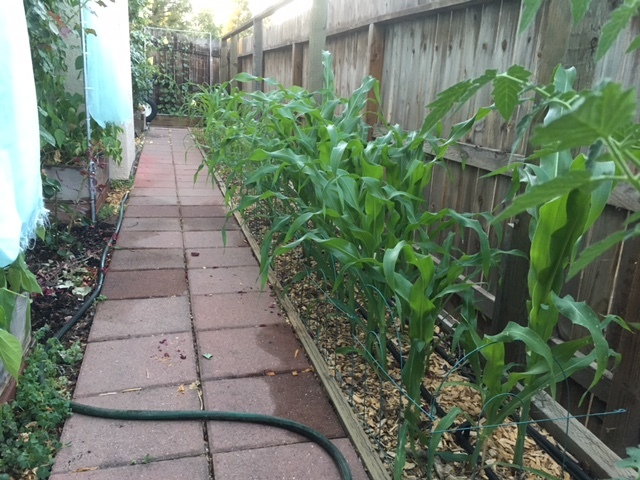 Looking the other direction down the fence are the SQ corn, sorghum, Gem corn, a couple of sunflowers and okra. The two 1'x3' beds on the left are in front of 2 tall windows where it gets really, really hot. I have some curtain sheers up but I'm still pondering what more I can do. Pole Blue Lakes. Here are bush Blue Lakes in the second 2'x4' I am babysitting. 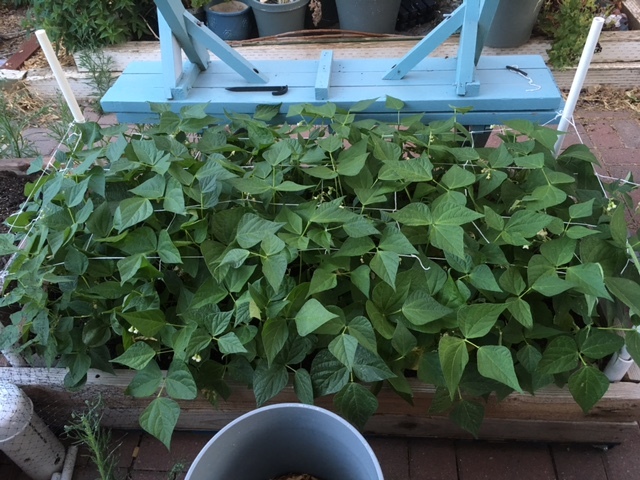 Same Mix but the beans seem to be thriving. Little 2" beans that are hard to see in the photo, but they are there!! Tomatoes, Black Vernissage, in the 2'x7'. 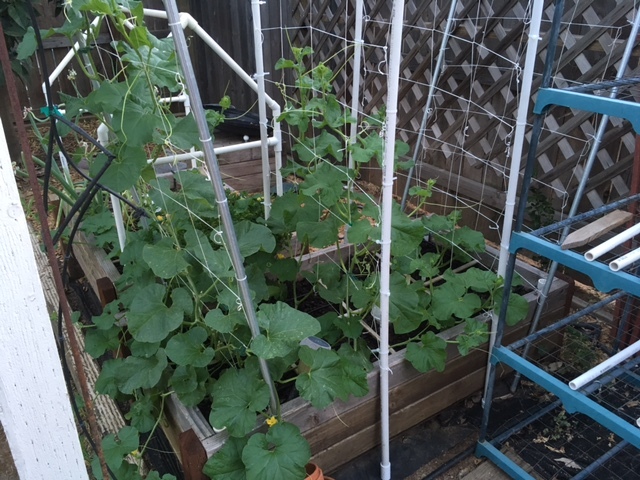 Winter squash and one sugar watermelon. 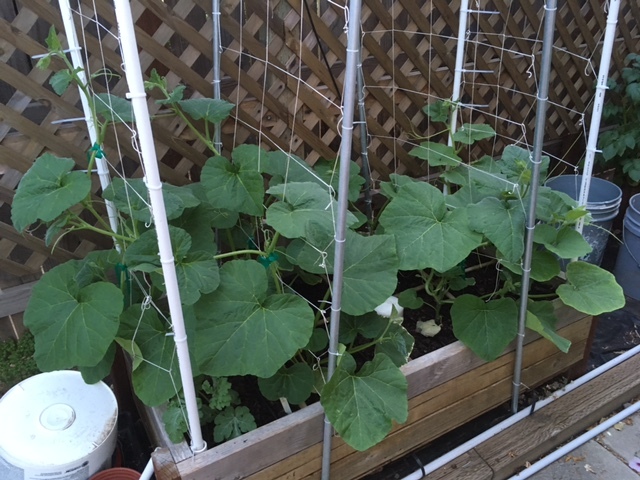 Cantaloupe, on the left is one survivor from the indoor winter seedlings and the other 7 are direct sow. Lots of runaway daughter vines and lots of male flowers. No females yet. Muncher cucumber! Only 3 indoor survivors and 5 little direct sows. The second photo of the bed shows the top dressing of Chunky home compost acting as a mulch. It is working very good. I will probably top that with chopped straw to keep the soil temps cool. Yes, I forgot to put the wood grids back in after I top dressed. Shoot, can't find the photo of the Chunky. Pepper bed. In this photo, you can see some of the winter/spring mess and dust that still needs to be cleaned up for cleaning's sake and for my company this Saturday. 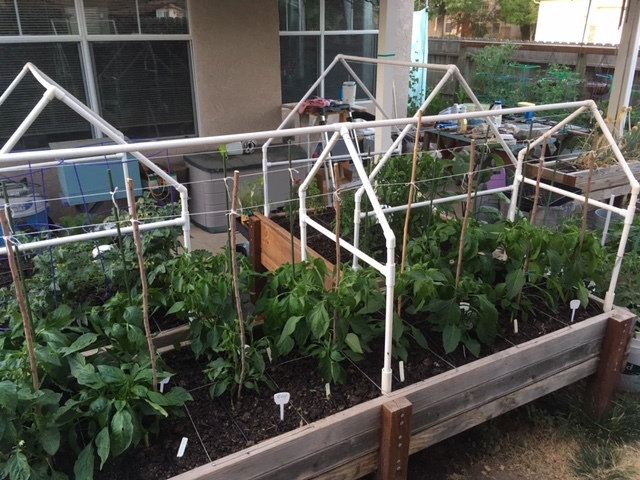 I'm trying stakes this year instead of flimsy pepper cages. Quite a few little peppers, hot and sweet. I didn't pinch off/top any of them this year. Just trying it. @BeetlesPerSqFt wrote: Looking good, Sanderson! Absolutely! It all looks great. Sanderson, I didn't realize it but I was mmming out loud thru your photos here at the office til finally one of my coworkers says, "Something look delicious over there?" That corn makes a BEAUTIFUL hedge! 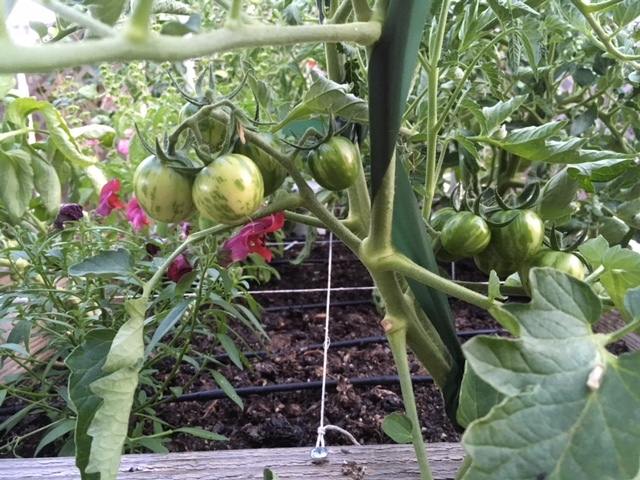 Got my fingers crossed for your maters this year. Fantastic as always sanderson. I love the photos of your garden. Thanks, folks. I am so hopeful, but there are still 3 brutal months ahead. You have a great garden, sanderson! Sunflowers also make a nice curtain for the area you mentioned. Might need to think about corn. I live in an Old orde Amish region, so they all grow old heirloom stuff. And corn....I have gotten corn and berries from them a lot.